The high-quality model PG23CP pressure gauge has been designed specifically for the requirements within the process industry. This safety pressure gauge is mainly used for applications in the chemical and petrochemical industry, the oil and gas industry, power engineering and also in water/wastewater technology. Typical measuring points are on control units and control panels such as hydraulic power units (HPUs). For secure mounting of the instrument, a high-quality front bezel is used. The mounting situations mainly require an IP66 ingress protection. For this reason, the sealing of the model PG23CP to the panel is made using a fully welded mounting ring and a matched flat gasket. 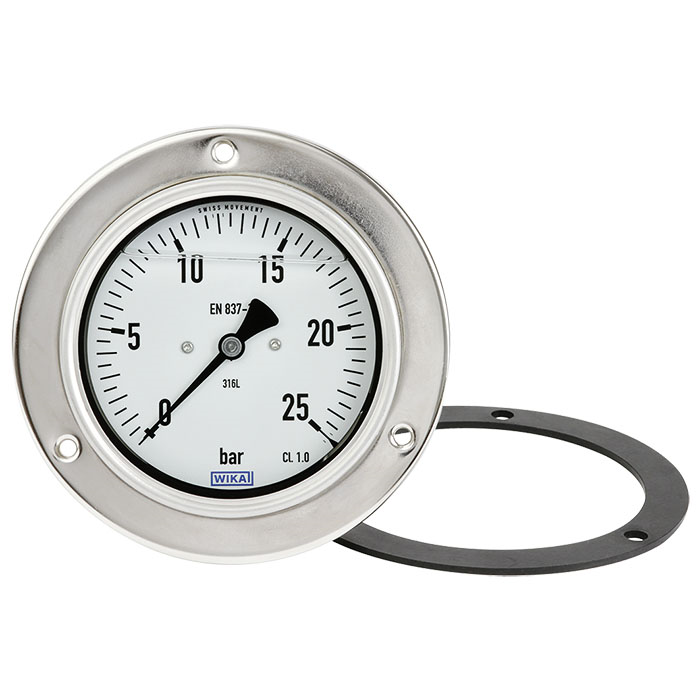 Pressure gauges for the process industry are manufactured completely from stainless steel for increased corrosion resistance. This enables use in the measurement of aggressive gaseous or liquid media, also in aggressive ambience. 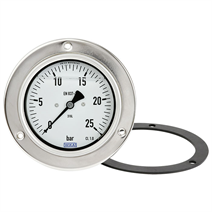 In the EN 837-1 standard for pressure gauges, safety versions are defined. For most applications, a safety version is not required. WIKA already manufactures the model PG23CP in the "S1" safety version. This design includes an additional blow-out opening, which vents any impermissible overpressure in the case (e.g. from a burst Bourdon tube) through the back of the case. For harsh operating conditions (e.g. vibration), all instruments are also available with an optional liquid filling.